No ties! Simply peel and stick! 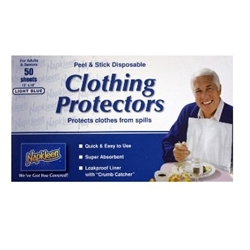 Napkleen™ will protect your clothing and reduce laundry loads. Features an absorbant front that soaks up liquids and a waterproof backing that keeps liquids from clothing. Napkleen™ is great for hospital patients and senior resident home or facility care and it will provide a new level of comfort and DIGNITY. 12 Boxes (50 pieces each pack) per case. See price break below.